What can one say about the Mission that hasn’t been said a thousand times. It’s a rich, wonderful cultural spot in the city, and unfortunately, the Mission being chewed up and spit out by high-end condos, and trendy shops and restaurants. It will be a huge loss for San Francisco when this area is overrun by money. 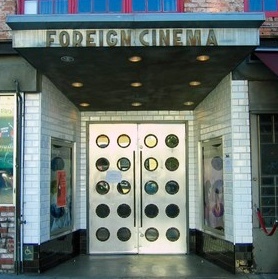 For now, we still have places like Foreign Cinema. Some my call this place one of those high-end restaurants, but it’s been in the Mission for over fifteen years. It’s a place you have to experience at least once, but be warned sometimes once is never enough. The menu is not extensive as some restaurants, but some might say it allows the kitchen to perfect their dishes. It also changes on a fairly regular basis, so know that if you’re looking at their website. What you see on their website isn’t necessarily what will be available to you at the restaurant. While the menu is well done and the food is good, it isn’t outstanding. Case in point. The night I went, there wasn’t a single vegetarian entrée on the menu. Sure they probably could have created something on the fly if I was a serious vegetarian, but that shouldn’t be the case. Every restaurant should have at least one option outside of having to order two or three appetizers. Another oddity in the food was their ahi tuna dish. It was served with potato chips. I’m sorry for $31, try roasting some potatoes, or at least mashing a few. I found it insulting and frankly tacky. The Bavette Steak was done to absolute perfection. It sat on a bed of roasted white corn and sliced potatoes. The slices of steak were medium rare, juicy, melt in your mouth tender, and topped with a wonderful tarragon sauce. Even with the few flaws, Foreign Cinema delivers a fun and interesting dining experience.